It took a little while for me to get back to my Magnolias, but I always have a few images with me! My Allie is turning 4 on July 9th and she asked Nani if she was going to make a book for her birthday. That's her way of asking if I am going to make her a birthday card! Well, of course Nani is! She loves to wear dresses and they need to twirl. The twirliest Tilda that I had was Sweet Tilda and I made her up for my Sweet Allie. I think she has the sweetest nature about her and she's one of my favorite Magnolia stamps. I do love her so! I am still working on my coloring, but some of it's coming back. All in all I'm pretty pleased with her and I know Allie will love her and that's all that matters. I love and cherish all of my grandbabies and thank God everyday that he's blessed me with these sweet babies. Just wish they didn't grow up so fast! Hope you enjoyed this little cutie pie. Have a great day! AH! Allie IS going to love this!! She is just precious and you know I love that bling! Oh I love this card and it's colours. the stamp is very sweet. gorgeous embellishments. I agree, Allie is going to love this. Nice card! Welcome back! Allie is going to adore this card...this is sooooo cute. Love all the glue and the glitter, every girls dream. 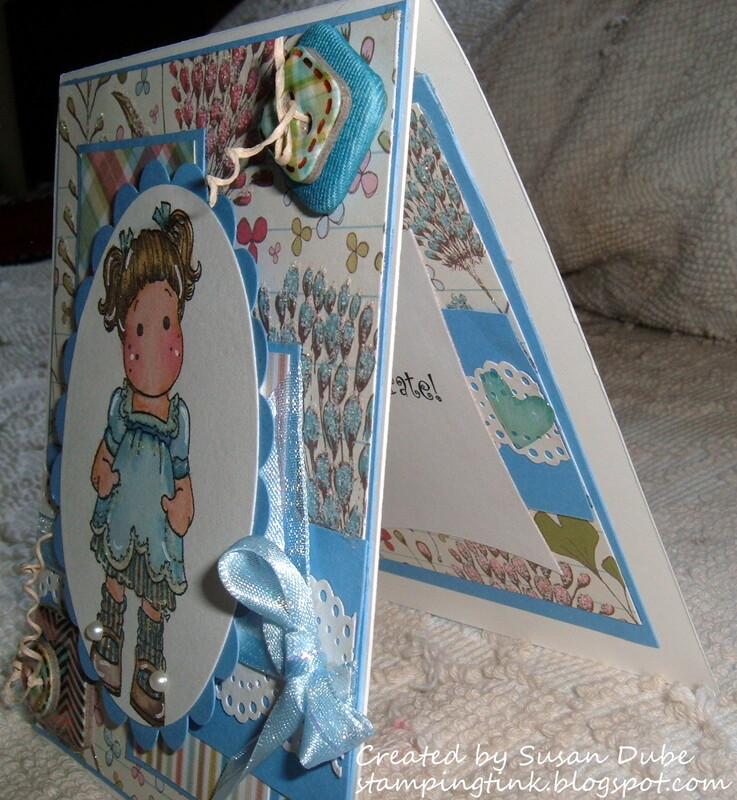 She's simply beautiful in blue Susan...she's super cute & love the patterns and embellies too! Glad to have ya back, you were missed! Oooh she's so shiny and pretty!!!! Lovely card! 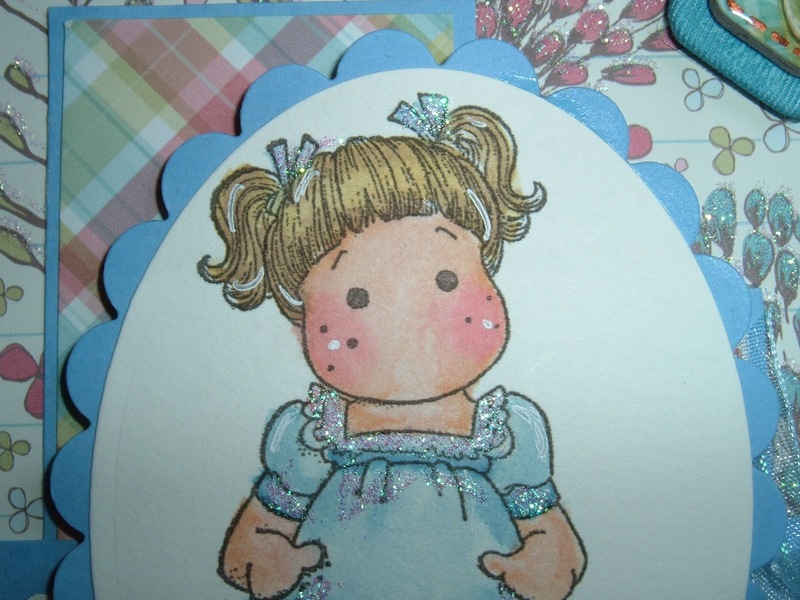 This is an adorable little card, and I know your granddaughter will love and treasure it! Allie is going to love her card. You did an awesome job coloring Tilda Sue. I love the colors and embellishments you chose too. Your card is so sweet and pretty. Love the colors. Welcome back! 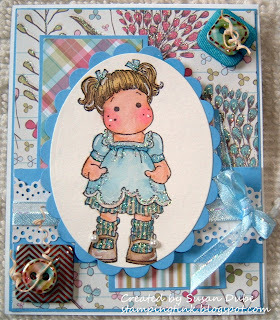 I have to say that I LOVE your card and am sure your grandaughter will too! Adorable card, girl! Allie will love it! Fun and lovely DP with the blue contrast. Sweet Tilda card Susan!